We often say that the students of today are the leaders of tomorrow. And for ten lucky students at St. Didacus Parish School, their dreams of becoming the leaders of tomorrow recently took a big step toward becoming reality. 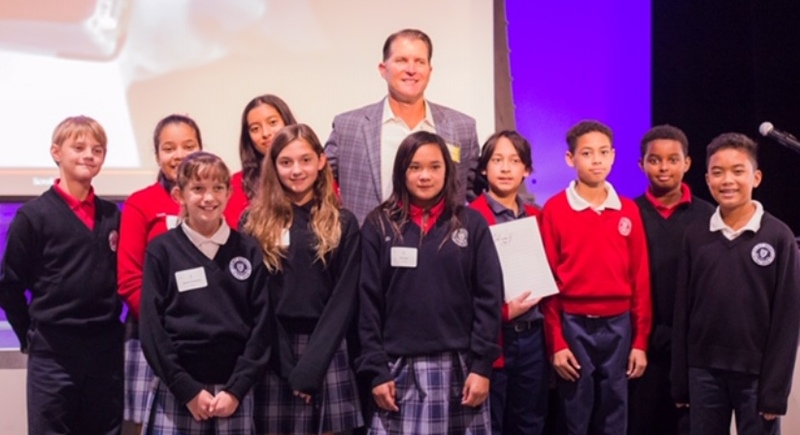 On Wednesday, November 28, they had the opportunity to attend the Middle School Leadership Conference held at both Our Lady of Peace Academy and St. Augustine High School. This conference was a joint effort by both high schools to help provide training and to inspire leadership among children in sixth and seventh grades. The day was packed with activities, including Mass in the respective school chapels, workshops, projects, and guest speakers. It began around 8:00 in the morning, and continued until noon, when the girls at OLP joined the boys at Saints for lunch. After lunch and a brief group activity, they were treated at 1:00 to a guest speaker, Michael John Sweeney. Mr. Sweeney is a former major league baseball player who talked to the children about the important qualities that all leaders need to be successful in life. Many students noted afterward that they came away with a much better sense of what it means to be a leader in the community at large. One seventh-grader who attended said he now sees life as being much like a tandem bicycle, where “you put Jesus on the front seat and yourself on the back, and simply trust and have faith that Jesus will lead you down the right path.” Another student said she took note of one small task that Mr. Sweeney noted would go a long way. “He said, ‘The first step to changing the world and being a good leader is to make your bed every day.’ So the first thing we all did the next morning was make our own beds!” Yes, the kids were absolutely pumped up afterwards! Having that knowledge is indeed the best way to learn.